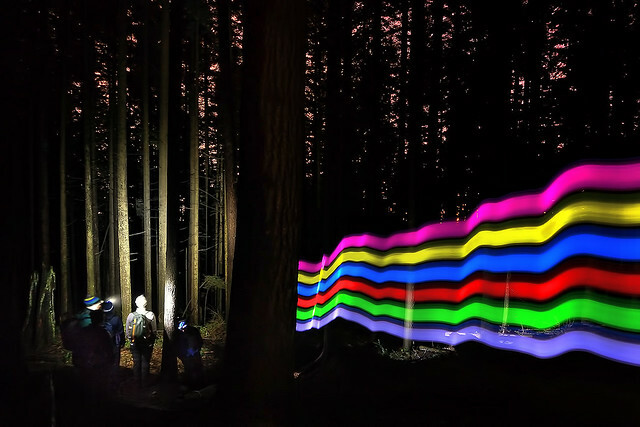 “We started the early hike from Mount Seymour’s parking lot with some light rain and fog. After ascending for half an hour, we found the trail fully covered by snow, and poor visibility made it harder to follow trail markers. While we weren’t prepared for the mid-July snow cover of up to 1 metre at points, our trekking poles helped us avoid serious injury besides a couple of slide-and-scratches. “This is a great hike with two points of interest. First, is the big cedar tree, which has been estimated at over 600 years old; the second is Kennedy Falls. Don’t let the length and elevation gain of 170 m fool you for this hike. There are many ups and downs on this trail making the cumulative elevation gain 750 m. The length of the trail is 5 km, so the return total is 10 km. 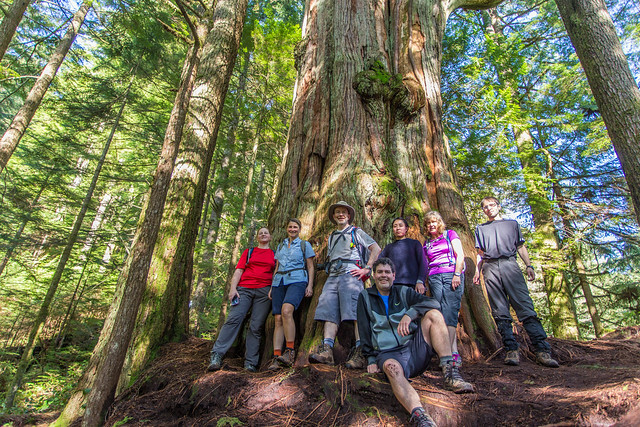 The trail traverses the west slope of Lynn Valley and you will find the big cedar tree 3.3 km from the start; also of note – the big cedar tree is less than 100 m from Lynn Creek. The cedar tree is massive and the only reason I think why it was spared from the saw in the early 1900s, when the whole area was logged, is that there was no saw large enough! The end of the trail marks Kennedy Falls, which is spectacular and fills the air with wind, mist and rainbows. There is a new parking lot at the trailhead on Mountain Highway, which fills up fast, so get there early. This is a very popular mountain biking area. 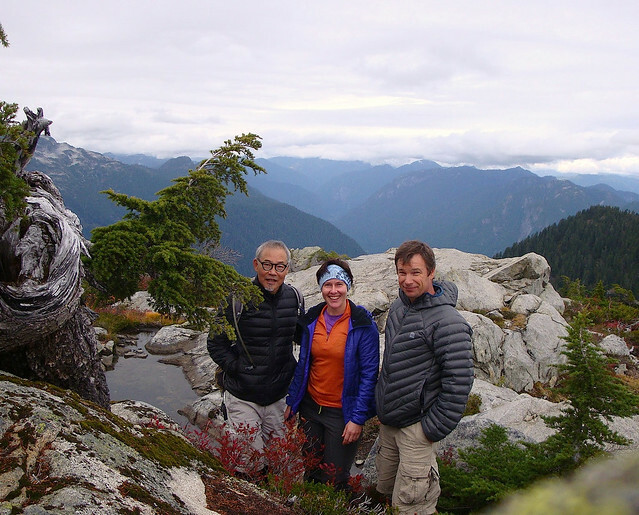 “This was a bike & hike trip into the Seymour Valley up to Mt Bishop at 1509 m. We, a group of 4 hikers, set out with our bikes from the gazebo at the entrance of Seymour Valley Trailway at 8.30 am and pedaled all the way back to the dam on the paved road. Up over the Bear Bridges, a bit uphill and on to the Mt Bishop trail. It took us one hour to cycle in. The first part of the trail is pretty steep with a lot of ropes for help. On a wetter day the downhill could get quite tricky here as the trail is very muddy and slippery. At the lakes, half-way up, one of the hikers decided to descend again to return to the city and 3 of us continued to the peak. Just below the peak on the rock field it is not immediately clear where the peak is but it becomes clearer as you get up over a little gully with a view to the peak. It is a bit of a scramble at the top where you have a beautiful 360 degree view. Lots of water on the way up to refill water bottles. We were back at the gazebo at around 6.15ish quite tired, with some scratches, bruises and dirty pants.